There are two options in the Emergency Medical Services profession. Students in this field can go into EMT-Basic or Paramedic. EMTs and paramedics have a much faster than average job outlook for the future according to the Bureau of Labor Statistics. The OTC EMT-Basic program is the first course to complete and is a six credit hour class which students complete in 16 weeks (8 weeks in the summer). Students who successfully complete the program will qualify for the National Registry practical and written examinations. Successfully passing the exams will qualify the applicant to apply for licensure in the state of Missouri by the Bureau of Emergency Medical Services and by the National Registry of EMTs. 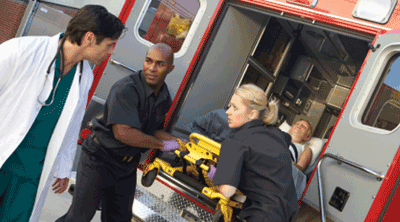 OTC offers the Paramedic program as a certificate program or a degree program. The program consists of classroom lectures and completion of clinical and field internships. Students who complete the degree program will receive an Associate of Applied Science (AAS) from OTC and qualify for the paramedic certification exam through the National Registry of EMTs and licensing through the Missouri Department of the Bureau of Emergency Medical Services. The OTC Paramedic program is accredited by the Missouri Department of Health & Senior Services and Emergency Medical Services and nationally accredited by CoAEMSP. In accordance to Federal Regulations, the federal government requires each institution to provide pertinent information regarding Gainful Employment programs. The information includes general program information, cost, student debt, student completion (graduation) and job placement. Review the Gainful Employment data for your selected program of study. Transfer of Professional Equivalency Credits. The OTC EMT program provides advanced placement for qualified students. Advanced placement is any process where the EMT program formally recognizes prior learning of a student and applies that recognition toward meeting the program requirements. The program determines on a case-by-case basis whether to allow a student to “place out” of specified program requirements such as didactic, laboratory, clinical or field internship requirements. This may shorten the time for completion of the program and is often thought of as an alternative pathway to program completion and eligibility for the National Registry or state examination at the paramedic level. These types of students often include physicians, registered nurses, licensed EMT Basics, Advanced EMTs, Intermediate EMTs and paramedics. All students completing the program must demonstrate they have met all program requirements. Students who completed requirements via advanced placement must document that they met the minimum program requirements (didactic, laboratory, clinical and field requirements). OTC considers all students who complete the program, including those in advanced placement, graduates and includes them in program outcomes calculations. http://www.health.mo.gov/safety/ems/pdf/deployedmilitaryrelicensure.pdf. Once state licensure is obtained Military students may qualify for advanced placement. Career Services posts student/graduate achievement results at: students.otc.edu/careerservices/. The program encourages students to attend a General Allied Health Informational session to learn what is required prior to and during the application process. Allied Health office offers informational sessions frequently and no appointment is necessary.